A dual-sport motorcycle is a type of street-legal motorcycle that is designed for both on and off-road use. The terms 'All-road' and 'Dual-purpose' are also used. Dual-sports are equipped with street-legal equipment such as lights, speedometer, mirrors, horn, license plate mounting, and muffler and can, therefore, be registered and licensed. 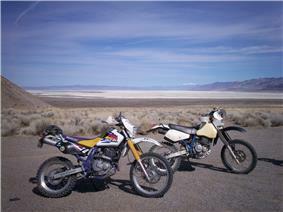 Examples of dual-sport models are found in Category:Dual-sport motorcycles. Yamaha is credited with rekindling popular interest in dirt worthy motorcycles that could also be ridden on the street. In 1968 they introduced the hugely successful DT-1 based on a 250 cc two-stroke engine. Other manufacturers soon followed with similar models called "enduros". These light weight machines were good on trails and adequate on pavement. Over the next 20 years, manufacturers began producing heavier and less dirt worthy enduros based on four-stroke engines, as they searched for better combinations of weight, power, durability, performance and comfort. The heavier machines were less popular with “real” dirt riders, who began modifying them to create lighter and more competent trail machines. 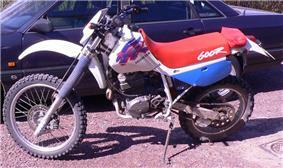 Suzuki introduced the DR350 in 1990 and promoted it as a DualSport or “dirt bike with a license plate”. 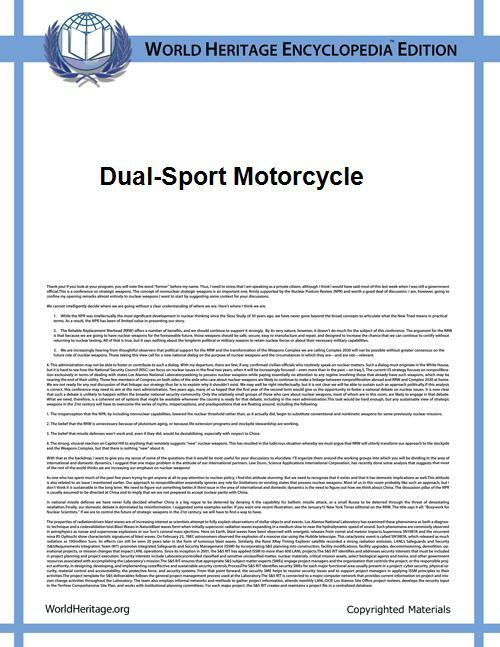 The terms "dual-sport" and “dualie” were quickly adopted by riders and the motorcycle press. Manufacturers use several different names for their dual-sport models. Suzuki uses DualSport to describe its products. Kawasaki describes its offerings as dual purpose, Honda lists its entry under off-road, and other manufacturers describe machines as enduros, or simply list them as model numbers. A few models are described as "adventure bikes". Despite these differences in terminology, these models can be described as dual-sports, which are street-legal motorcycles that can be operated on pavement, dirt roads and trails. Dual-sport motorcycles are the most practical choice in rural areas in many parts of the world, and when traveling on unpaved trails they can often be a necessity. The BMW 1200GS is in front with a Suzuki DRZ400 behind it. Terms such as dual-sport, enduro and adventure bike are marketing descriptions, not strict definitions of weight, power, and intended usage. For example, the lightest dual-sport offered by Suzuki Motor Corporation in 2008 weighs about 250 pounds (110 kg) and has a small single-cylinder engine with barely enough power for highway use. The heaviest dual-sport offered by Suzuki Motor Corporation in 2008 weighs about 460 pounds (210 kg) and has a large two-cylinder engine with plenty of power for long freeway trips. Accordingly, it is necessary to refer to the manufacturers specifications for a particular model to learn more about its intended use. There are four ways of creating dual-sports. Some manufacturers add street-legal equipment to existing off-road motorcycles. These bikes are usually light and powerful, at the expense of shorter service life and higher maintenance. This approach is currently taken by European manufacturers such as KTM and Husqvarna. Other manufacturers start with a clean sheet of paper and design a new model designed for a specific combination of dirt and street use. These motorcycles are usually heavier and more durable than the models derived from off-road motorcycles. This approach is currently taken by Aprilia, BMW, Honda, Suzuki, Yamaha and Kawasaki. Several manufacturers modify street motorcycles to make them more dirt worthy. These bikes are usually more at home on pavement. Finally, owners add street-legal equipment to off-road bikes. In USA, some states only license motorcycles that meet emissions requirements. Dual-sports may be grouped by weight and intended purpose. Lightweight dual-sports weigh about 250 to 300 lb (110 to 140 kg). They have high fenders and ground clearance plus long travel suspension, and usually come with aggressive dirt oriented tires known as “knobbies”. Lightweights are closest to pure dirt bikes and are most at home on rough trails and two-track roads with occasional forays onto pavement. Middleweight dual-sports weigh about 300 to 350 lb (140 to 160 kg). They usually have less suspension travel and ground clearance than lightweights, and often come with tires that offer a compromise between dirt and pavement performance. Middleweights are most at home on smooth trails, graded dirt roads and pavement. Heavyweight dual-sports weigh over 350 lb (160 kg). They are designed primarily for riders who want to travel long distances on pavement with occasional forays onto dirt roads. They usually come with smoother tires that perform better on pavement. Motorcycles of this type are increasingly favored by a subset of touring riders who never intend to ride off-pavement, as they tend to offer comfortable riding positions, reasonable range, and the ability to carry luggage, while weighing less and performing more nimbly than a traditional touring bike. 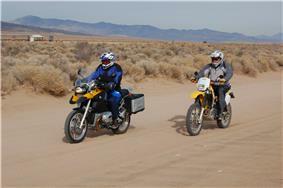 These motorcycles are also called adventure or adventure-touring bikes by some manufacturers. These types are only approximate and new models that split the boundaries and offer different combinations of features appear each year. However, the laws of momentum and inertia always favor lighter dual-sports for tight, rough trails. Heavier dual-sports that emphasize rider comfort and the capacity to carry luggage are better choices for long highway trips. Dual-sports, by definition, are compromises - giving up some dirt performance to be ridden on the street and some street performance to be ridden in the dirt. The merits of a particular model can only be judged relative to the owner’s intended mix of dirt and street riding. Although aficionados may argue the merits of different models, versatile dual-sports can be desirable alternatives to more specialized motorcycles that can only be ridden in one environment. Most dual sport riders fall into 3 broad categories. Mainly commuting road riders who tour on sealed roads and at times go on rough roads or formed 4 wheel dry tracks. These need a larger cc motorbike that can cruise at high speed without stress or vibration. Suzuki, Kawasaki and BMW offer good single cylinder 650 bikes. The BMW has a low seat, is well equipped but is more expensive. The Kawasaki has a fairing and screen but is heavier. The Suzuki is by far the lightest and is ultra reliable. The DR650 is the most common dual sport bike in Australia, where distances are very long and temperatures high. It is often used by hire companies. These bikes can carry big loads without loss of performance or reliability. Mainly dirt bike riders who only have to travel a short distance on highways. These riders look for a smaller, lighter bike, often with low gearing that can handle steep,or rocky single lane tracks. Most riders select bikes in the 250-450cc range. These agile bike are designed to be ridden standing up in rough terrain and have high, narrow seats with lots of suspension movement. They are not intended to carry large loads. They often have a higher power to weight ratio than other dual sport machines. The third group are long range adventure riders who intend to travel for many weeks or months. BMW, KTM, Triumph and Ducati make a range of large motorcycles from 800cc up which are intended for long range travel on smooth and rough roads. These bikes can support immense loads of supplies such as tents, camping gear and spare parts/tires and still travel at high speed on unformed roads, but are not suited to single track rising as they are very heavy and lack agility. If a large adventure bike falls over it will usually take 2 people to lift it up when loaded. 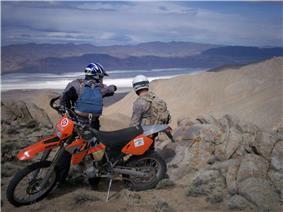 It is common for dual sport owners to customise their bike to match the type of terrain or roads on which they ride. Changing tires, handlebars, seats, bash plates or foot pegs are common modifications. Adding large petrol tanks, racks, luggage and wind screens are common for riders intending to travel far. In USA and Australia there are many business making dual sport accessories. When dual-sports are fitted for long-distance travel with accessories such as oversized gas tanks, luggage, and other distance-oriented gear, they are often referred to as "adventure bikes". These motorcycles offer touring capabilities, but are less comfortable on long pavement trips than full-fledged touring motorcycles such as the Honda Goldwing series. A supermoto (also known as a supermotard or motard) is typically a converted motocross bike with less suspension travel, smaller front and rear wheel wheels (typically 17" at both ends), road tires and an oversized front brake designed to be primarily run on asphalt. When made street legal, these bikes may also be considered to be a type of dual-sport. In this case, these motorbikes could be seen as somewhere between a sport bike and a dual-sport.